This should be the mantra of every person who uses, or intends to use, an analytics platform to track and measure site usage and egagement. The reason for taking this approach is simple: you need to know what you are looking for in your data otherwise you’re will have lots of dots with no clear way to connect them. You need to know what data points are important to your organization and focus on them to evolve your web presence. Before delving into the plethora of analytics options available – and subsequently wasting time via many trials and errors – it’s best to establish the questions you have about your site’s usage. Once you know the questions you need answered you can begin to assess the platforms that will answer your questions appropriately. We’ll help you understand a few of the available analytic platforms to get you thinking about the possibilities. Good for: Real-time analytics, unique user name-tagging and tracking, heatmaps. Webtrends’s Reinvigorate is a robust real-time analytics platform whose focus falls on individual user activity. The tool-set provided by Reinvigorate ranges from real-time user monitoring, to cursor heatmapping, and basic referrer analytics. 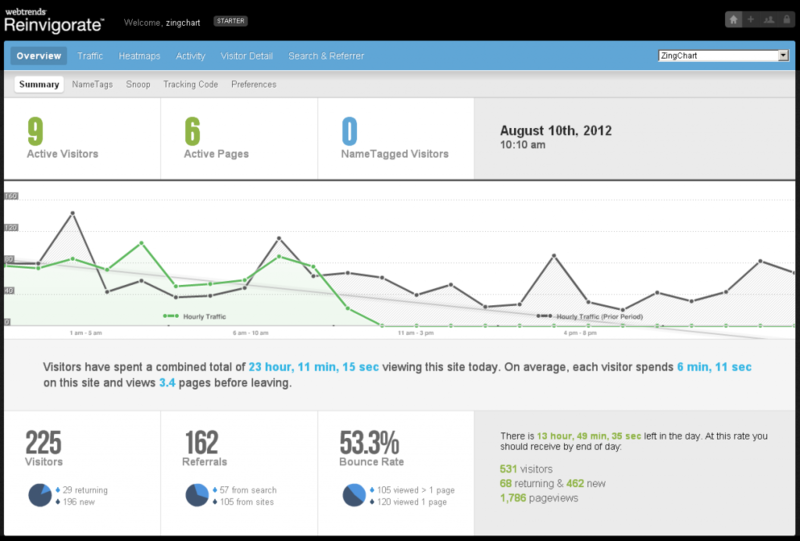 Reinvigorate also has useful options like a desktop dashboard called Snoop, which can be used to track user activity. The platform also offers user ID-tagging to establish unique names for users. With Reinvigorate’s real-time reporting, a summary of active visitors and pages can be seen in the dashboard. Further details can be accessed by viewing the Activity pane. Here, each active user is given a unique session ID, which allows details like the current page they are viewing and previously viewed pages, time on site, number of return visits, and location details to be attributed to their profile. Session IDs can be changed to custom name tags, such as a user’s actual name, if one can be established through a conversion (e.g. download, contact form submission). This is useful to see a sales lead’s movement through the funnel on a site. It also serves as more intuitive way to see and get to know your site’s users as opposed to the default session IDs, which are harder to keep track of as they are long strings of random numbers. Reinvigorate captures user click data to compile graphical heatmaps displaying the most frequently clicked locations on a page. Heatmaps can be viewed in several different manners and over different time frames, up to two months back. Pricing: Pricing starts at $10 per month for the starter package, which allows for up to 500,000 pageviews per month, and ranges to over $100 per month for sites with over 1 million pageviews per month. Good For: Recording visitor site use, monitoring attention content receives. ClickTale offers a number of user activity monitoring tools aimed at assessing customer experience and analyzing conversion processes. Product offerings are broken into three separate suites: a mouse tracking suite, a heatmap suite, and a conversion suite. The most notable tool in ClickTale’s suite is visitor recording, which records a screen capture of a user’s entire browsing session in its entirety. Ever wanted to see exactly what users are doing on your site? That’s what analytics are for, right? Wrong. That’s what Visitor Recording is for. ClickTale’s visitor recording creates a real-time video of a user’s entire browsing session, allowing you to see details that statistical analytics cannot display, such as click hesitation, searching for calls to action or desired content, and exactly what users are looking at and for how long. ClickTale’s attention heatmaps allow users to see how much attention areas of a page are receiving. Areas where attention is focused are displayed with colored bands ranging from blue, for less viewed, to red, for more viewed. In order to determine where visitors are looking at a page, ClickTale uses a compilation of average page scroll positions from site users. Attention maps also display the percentage of visitors that scroll to specific points of a page. Pricing: $99/month for the basic plan (up to 20,000 pageviews per month) up to $990/month for 300,000 pageviews. Good for: Customer user action tracking, funnel analysis. By adding properties, data can be broken down in a number of different ways using Mixpanel’s segmenting tool. Segments can display data sets with certain constraints like visitor is from “Country = X”, and is “Gender = X”, and “Has Account = True/False”, which will display a breakdown of users who fit the criteria. This can be used to show characteristics and demographics of people coming to your site. Create custom funnels by selecting the actions that reflect funnel entrances and completion. Since each step of a sales funnel means taking a specific action, Mixpanel is well suited for funnel analysis. This tool can be used to track user engagement from the first time they click to learn more about a product or service, to when they sign up, and finally make a purchase. Funnel analysis with Mixpanel also has the ability to see the time it took to move through the funnel and visualize whether or not your conversion rate is improving. Pricing: Free for 25,000 data points, $150/month for 500,000 data points, up to $2,000/month for 20,000,000 data points. **Good for: **Sales lead tracking. LeadLander primary function is to provide usable lead information for your sales team. 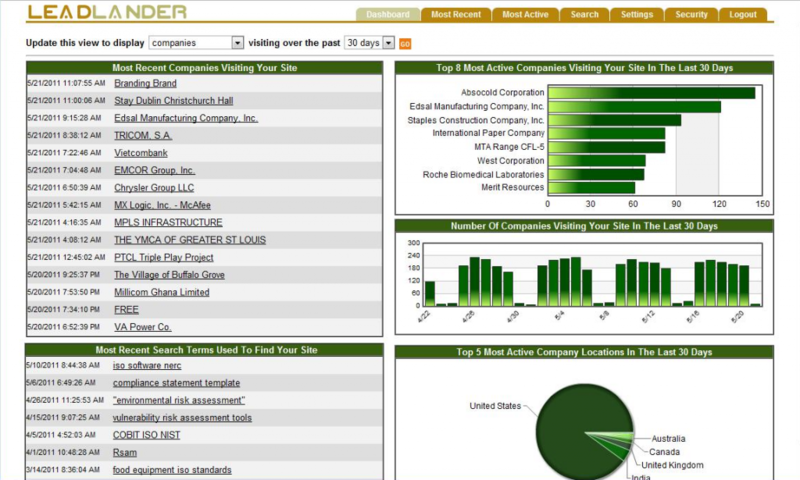 Simply knowing a person visited your site isn’t very much lead information to go on, so LeadLander identifies visitors’ company, and logs their visit history, building a profile over time. Knowing which companies are on your site allows you to identify potential good leads and where sales resources might want to be spent. LeadLander assists with this by providing the names of companies viewing your site and logging their visits over time so you can see their progress through your sales funnel. Pricing: Via quote request only. It’s crucial to know what data is most useful for your company’s analytics tracking. Are ebook downloads important? Is there a contact form you want filled out? Or certain information you want users to view? Think about what types of actions on your site you need to know about to improve business. When you have a good grasp of the most important pieces of information, you can then find the best tool for the job.